2 months ago I moved from Richmond, VA, where I’d lived for, oh, about 15 years to a location a few hours to the north, just outside the town of Leesburg, VA. My new home is just a short walk to the Potomac River and I’m starting to explore the area. One of the side-effects of living so close to the river is foggy mornings, which is something I’d hoped for. Something I didn’t quite expect was foggy mornings even in below-freezing temperatures! This morning saw just these conditions. While not quite cold enough to lower the temperature of all the trees to create hoarfrost, we did get a good mix of atmospheric fog and frosty conditions on the ground. 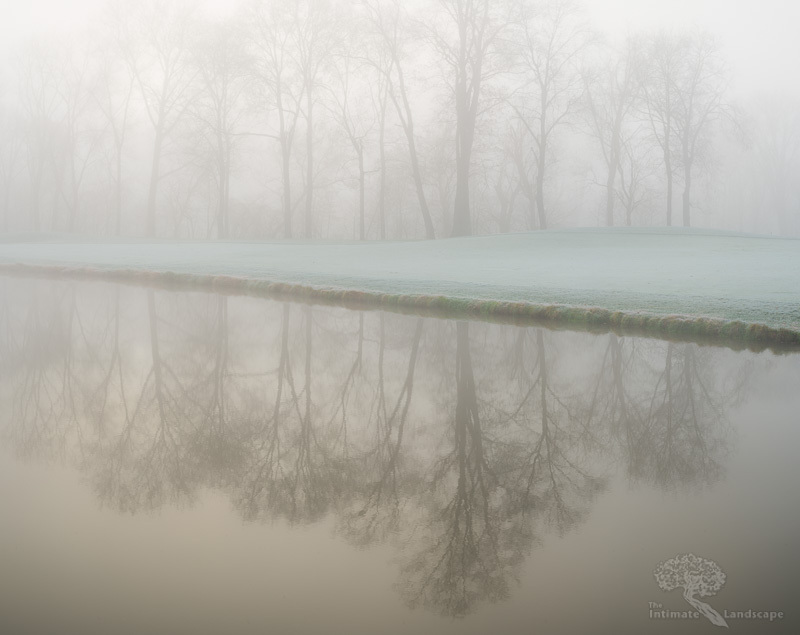 The scene below was taken at a small pond on a golf course at the confluence of Goose Creek and the Potomac River. A combination of fog and below-freezing conditions add up to a wonderful morning scene. I love the colors that come out in conditions like this. The sun is rising behind the trees in the background, but the fog is so thick you can’t see it. The fog adds a soft warmth to the light, and the frost on the ground creates an equally soft blue-green tone. I’m still experimenting with the multi-image collage technique and this image is yet another product of those experiments. This is the result of a 15-image composite, 3 rows of 5 vertical images each. Taken with a Nikon D800, Nikkor 24-85mm lens zoomed to 80mm. Each image was shot at 1/25th second @ f/11, ISO 100. I’m using a Really Right Stuff Lightweight multi-row panoramic head kit for these images. This entry was posted in Landscape Photography, technique and tagged fog, Frost, Pond, Trees.